If you are interested in a wedding cake by ‘Designer Cakes by Elle’, please contact us to request a cake consultation and tasting. Here you can try samples, talk through design ideas, colours, size of cake required etc. If you have ideas to incorporates such as images, flowers, colour/material swatches etc please feel free to forward these or bring them with you. Alternatively, this meeting can be a complete starting point in the design development and decisions do not need firming up until nearer the time. We provide a delivery and set up service at your venue by prior arrangement. Please contact us for a quotation and availability. There may be an additional delivery charge, dependent on the distance from Kingston, Surrey, to be advised on request at booking. If your cake design requires fresh flowers, your chosen florist will supply these and we can liaise directly with them to co-ordinate the design. 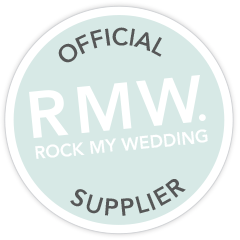 If you wish to collect your order we will be happy to advise on transportation, storage and the installing of your cake. 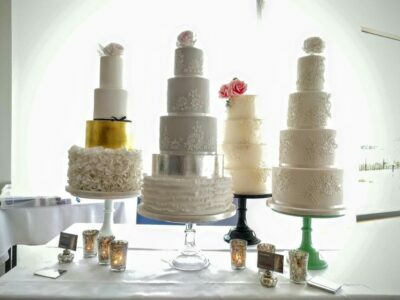 We are able to hire out a range of elegant cake stands. Please enquire for more information on these. We require a security deposit and stands must be returned 2-4 days after the event. We always do our utmost to accommodate requests. To avoid disappointment, we recommend that you book your cake as soon as you have made your decision e.g. 6-9 months in advance especially if you are having a summer wedding. However, we are sometimes able to accommodate requests with less notice so please do enquire. A 50% non-refundable deposit is required on order confirmation please. The remaining balance is due six weeks before delivery or collection. Please contact us with any queries or requests for more information.